The main goal of present heavy element research is to find the "island of stability". 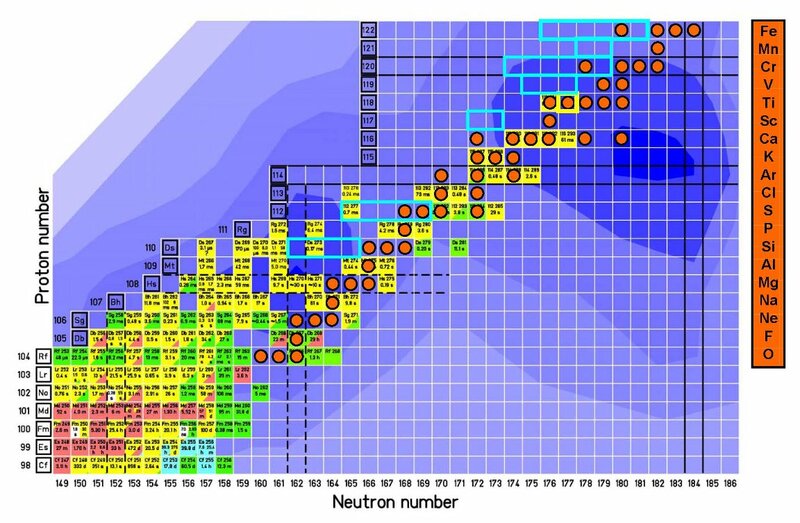 This is a region on the chart of nuclei which comprises isotopes with significantly enhanced stability. The discrete energy levels ("shells") in these nuclei are occupied with the maximum possible number of neutrons and protons ("closed shells"). This results in nuclei which are strongly bound and, hence, show high stability with respect to other nuclei. Up to now, this island of stability has not yet been localized in the experiments. Only theoretical predictions exist which give, depending on the respective model, the proton numbers Z=114 or 120-126 and the neutron number N=184 as location of the island. The existing experimental data rather point to the region Z=120-126 as the "island of stability". The future super heavy element research at SHIP will concentrate on the systematic investigation of elements in the region of 114-120 protons and neutron numbers as close as possible to N=184. Nuclei with more than 118 protons have not been synthesized yet by any experiment. In general, the fusion is easier if the projectile and target masses are as unequal as possible. For example, the reactions 64Ni + 238U, 58Fr + 244Pu and 54Cr + 248Cm lead all to the same compound nucleus 302120. But the probability to synthesize the element 120 is about 5 times larger with 54Cr + 248Cm (Z=24 and 96) in comparison to 64Ni + 238U (Z= 28 and 92). Therefore, the heaviest possible targets will be used in the future for super heavy element production at SHIP. The next series of experiments will be carried through with 248Cm as target. It has 4 protons and 6 neutrons more than 238U which was up to now the heaviest target used at SHIP. 248Cm is radioactive with a half-life of 340000 years.